Seared Scallops with Leek Risotto and Lemon-Brown Butter Sauce – Romance is all about making great combinations. 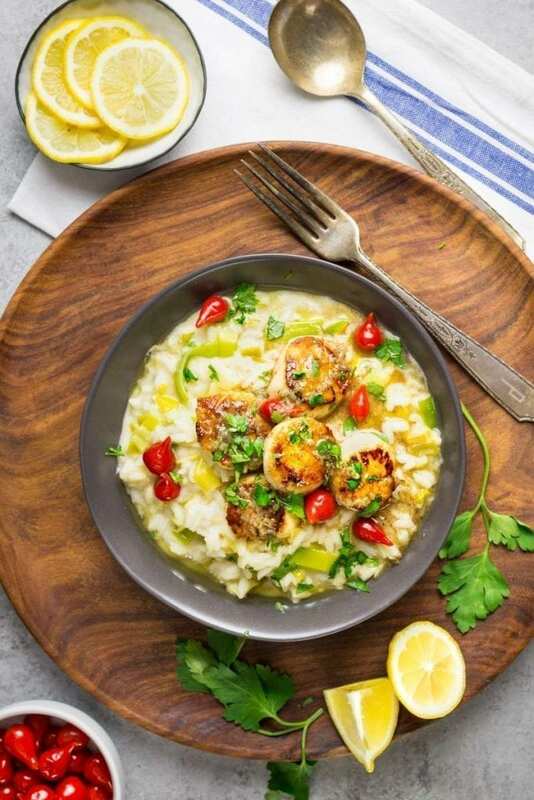 Scallops and risotto are two dishes that many people are nervous about making, but take the plunge. Trust us: it’s easier than you think. Look, nobody likes hearing the words “cheap” and “romantic” in close proximity. It’s just not done. “Darling, let’s go on a budget date this Valentine’s Day” is a phrase that greeting card vendors are unlikely to adopt for their February 14th stock. 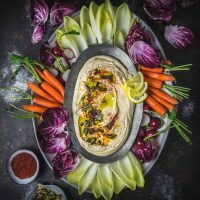 But I’m here to tell you that you can put together a romantic dinner for you and your beau with just three main ingredients (plus a few sundries), and honestly, none of them will break the bank. 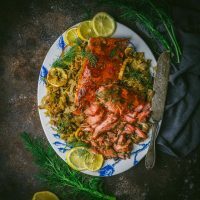 If you’re looking for the true meaning of romance – putting some thought and care into your event, seeking out the best ingredients you can find in your neighborhood, and ace-ing the timing of the scallops and risotto – we can tell you that yes, you’re going to impress your partner. It’s important to get the right kind of scallops: sea, not bay (which are much much smaller); and to get that sear you should insist on fresh (never frozen) dry scallops (untreated with tripolyphosphates). 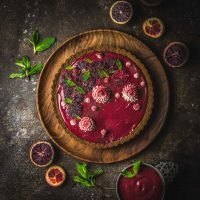 Your fishmonger will be able to tell you which kind they have; they’ll also look different (dry scallops are pink-hued and translucent; wet scallops are much whiter and will leach out milky fluid). For our recipe, we could only find what’s commonly referred to as “medium”-sized (U20), meaning that you’ll find around 20-30 scallops per pound. (We had 24.) You can also find “jumbo”-sized (U10) where you’ll have around 10 pieces at the same weight. The larger variety are slightly easier to cook because you have a little more time to sear them without the risk of over-cooking but freshness is absolutely more important. Whatever the size, plan for approx. 1/2 to 3/4 of a pound for a dinner for two. And what about the price? It’ll vary by season and location, but we’ve generally seen them for between $15-$30 per pound. Not cheap, but less expensive than a seafood dinner out. 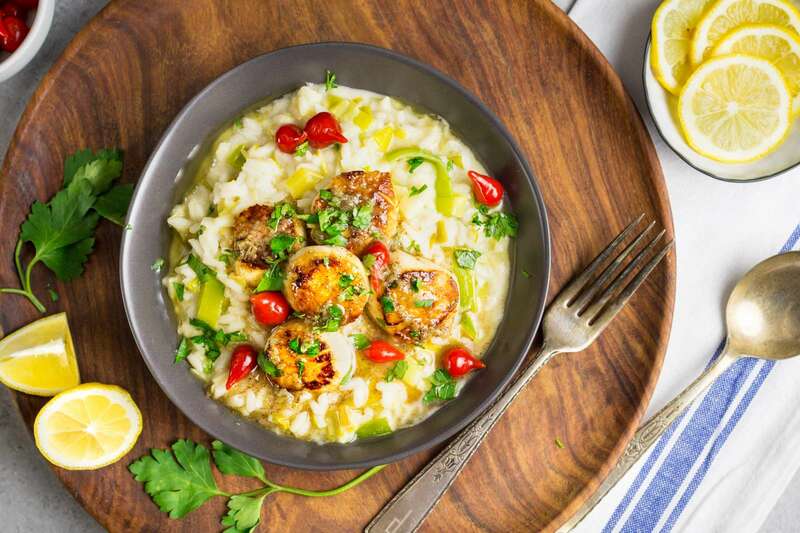 Seared scallops with leek risotto and a lemon brown butter sauce? Yes, please. The recommended preparation for scallops of any size is to keep them cold, dry them thoroughly with paper towels, and salt 15 minutes before you need to cook them. Do one last pat-down with fresh paper towels right before you cook, and they’re ready. Remember, the drier they are before they go in, the better they’ll sear. But let’s talk about the risotto, since that will be your first task in this recipe. 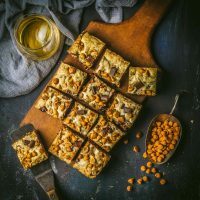 We favor carnaroli rice over arborio, since it holds its texture a little better and absorbs the flavors of the added ingredients well, but use whichever you can find. It’s hard to cook just a small amount of rice, so we’ve budgeted enough to make your dinner for two, and give you a good bowl of leftovers for the next day. Make sure that your leeks are washed well once they’re sliced (we like to use a salad spinner for this), saute them to soften, and combine with the rice. 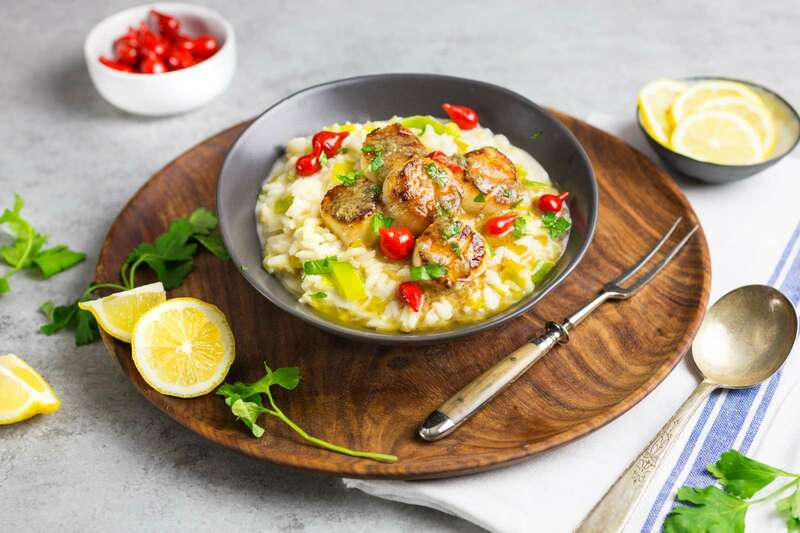 The key with the risotto process is to keep the broth hot in a separate pot, and add gradually while stirring – allowing the rice to absorb most of the liquid each time before adding a new batch of broth. 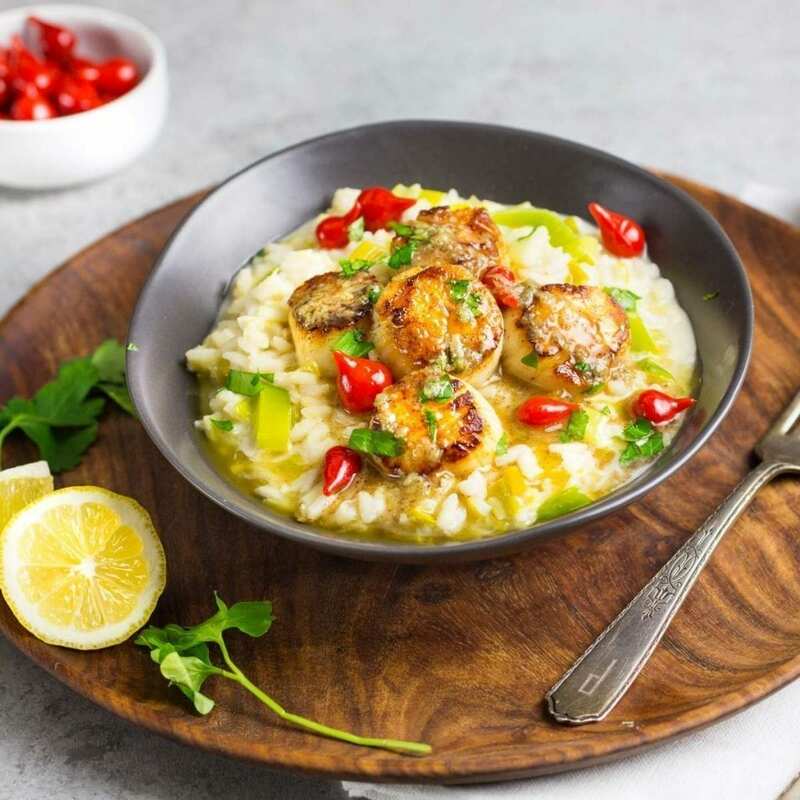 Once the texture is to your liking (we recommend just a little bite), finish with the rest of the flavorings, and keep warm while you prep the sauce and, of course, the scallops as the heroes of the dish. Scallops have a delicate sweetness that can be easily overpowered by strong flavors. Romantic, impressive and easy, a perfect combination for Valentine’s Day. We decided to add some bright color with sprinkled chopped parsley and sweet red teardrop peppers: you could also seed and add a few sliced jalapeños if you like a little kick. 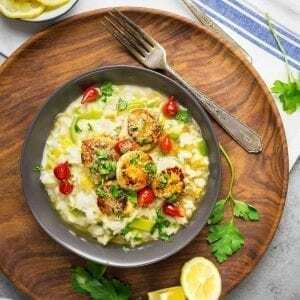 A little sweetness, a little spice, salty scallops and creamy risotto – if that’s not romance in a dish, I don’t know what is. In a medium pot, bring the broth to a simmer and keep hot over low heat. In a medium, heavy saucepan, melt oil and 2 tablespoons of butter over medium heat. Add the leeks and saute until tender but not brown, 5-6 minutes. Add the rice and stir to coat with the butter. Add the wine and simmer, stirring, until the wine has evaporated, about 3 minutes. Add a ladle-full (about ½ cup) of the hot broth and stir until almost completely absorbed, about 2 minutes. Continue cooking the rice, adding the broth ½ cup at a time, stirring constantly and allowing each addition of the broth to absorb before adding the next, until the rice is tender but still firm to the bite and the mixture is creamy, 15-20 minutes. Remove from the heat. Stir in the remaining tablespoon of butter, Parmesan, mascarpone cheese, the lemon zest and juice, and season with salt and pepper to taste. If rice thickens while you prepare the scallops, add a bit more hot broth or water just before serving. Add butter to a small saucepan set over medium heat. Cook, stirring or swirling the pan every few seconds, until the foam subsides and the butter begins to turn golden brown and smells nutty, about 3 minutes. Stir in garlic and let it sizzle for about 10-15 seconds then add and lemon juice and salt and pepper, to taste; set aside. Place scallops on a layer of paper towels and season with salt on all sides. Top with more towels and thoroughly pat dry. Let rest in the refrigerator for 15 minutes. Cook the risotto while you wait. Remove salted scallops from the refrigerator and pat dry again. Season lightly with a little more salt. Heat vegetable oil in a large stainless steel or cast iron skillet over high heat until lightly smoking. Add scallops, leaving space between each one to prevent excess steaming. Press each scallop down very lightly with a spatula to ensure good contact with the pan. Cook scallops without moving them until well browned on first side, about 1-2 minutes. Carefully flip scallops and cook until scallop is just cooked through, about 1 minute longer. Transfer scallops to a paper towel–lined plate to drain. Serve immediately on top of risotto, and drizzle with a tablespoon or two of brown butter sauce and a few peppers, if desired. Just made this on a rainy, September, Midwestern afternoon and it hit the spot. My husband and 13 year old went back for seconds. I’ll be making this again.